My Katu guide grips my shoulder and says “Shhhhh!” I freeze and peer into the forest around me expecting to see a small carnivore or wild pig. Perhaps if I’m really lucky I’ll get another glimpse of the elusive leopard cat. But my guide points up into the trees instead. “Khi, khi!” he says in a forceful whisper. There are monkeys above us. I see branches swaying and leaves rustling. Flashes of fur are flying through gaps of sunlight high up in the canopy. We both hunker down and wait quietly for one of the primates to slip out onto a branch and give us a clear view. I expect to see one of the numerous macaque species that are common in Central Vietnam. But I soon realize these aren’t macaques. After three minutes of neck-cramped tense anticipation one of the monkeys scurries down a trunk and stares at us. The view is excellent—and I am completely unprepared for what I see. Hanging before me is a red-shanked douc langur (Pygathrix nemaeus), one of the rarest, and for my money the most striking, primates in the world. That sight has been forever seared into my memory: crimson-colored stockings, ivory arms, coal-black hands, and silvery tail, with the long curling whiskers that one would expect to see on an 18th century British naval officer. For several seconds the dark-eyed face gazes at me with a quizzical expression. Then it disappears back into the treetops. All is quiet again. The red-shanked douc is only found in three countries: Vietnam, Laos, and a small corner of Cambodia. Most of its restricted range lies within the Annamite Mountains. It is mainly found in evergreen broadleaf forest but has also been recorded in karst limestone cliffs in the northern part of its range. Like most primate species red-shanked doucs are diurnal and live in groups. Although the species will occasionally eat fruit and flowers the vast majority of its diet consists of leaves. Healthy populations exist in several protected areas. Still, the general population trend is decreasing, especially in Vietnam where habitat loss and hunting pressure is highest. 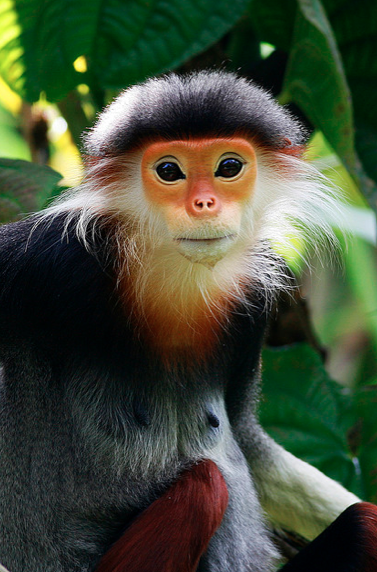 Like all primates in this region the red-shanked douc is hunted for subsistence. However, unlike other species in the Annamites the red-shanked douc is specifically targeted for the international pet trade, with most specimens being smuggled out of Laos into Thailand and Vietnam. It is currently listed by the IUCN as Endangered. Extensive habitat still exists for the species. If hunting can be controlled the population could rebound. That, of course, takes the political will necessary to enforce anti-poaching regulations. Much progress has been made on that front in the Annamites. But there is plenty of room for improvement. A successful red-shanked douc captive breeding program has been in place for many years now at the Endangered Primate Rescue Center in Cuc Phuong National Park, ensuring that the species will remain extant even if it is wiped out in the wild. However, as I’ve said with other animals highlighted in the Species Spotlight posts, I hope that this remarkable species continues to thrive in its natural habitat. Without it the jungles here would have an oddly empty quality. There’s no doubt about it: the red-shanked douc is a true gem of the Annamites.